Japanese warlord Toyotomi Hideyoshi dreamed of conquering China and launched two invasions of Korea, in 1592 and 1597, in order to do so. Although he ultimately failed, the wars inflicted terrible devastation on Korea. Because as its overlord the Ming dynasty in China sent a large army to aid Korea, the war also considerably weakened the Ming dynasty. In the 16th century, Japan underwent constant civil wars as the Ashikaga Shogunate weakened and various feudal lords sought supremacy; in fact this period was called the “Warring States” era in Japanese history. Hideyoshi was an ambitious general who rose from obscurity. By 1590, he had destroyed all rival lords and unified Japan, freeing him and his large army to conquer new lands. His target was China and to reach China he needed passage through Korea. When Korea refused his demands he led an invading army of 160,000 men, landing on the southern tip of the peninsula and advancing northward. The inferior Korean army was overwhelmed, King Sonjo abandoned his capital city Seoul and fled, and his two sons were made captives. 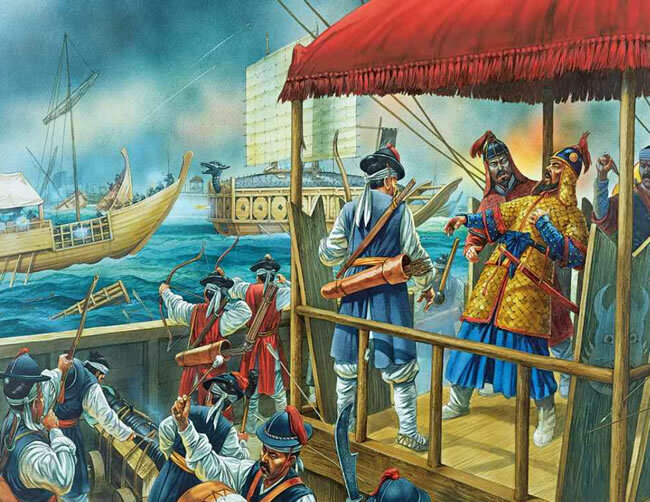 The Korean cause was saved from complete ruin by the emergence of Admiral Yi Sun-sin, who built a fleet of “turtle ships,” the world’s first wooden ships with steel plating, which repeatedly defeated the Japanese navy, thus disrupting their supply lines. Meanwhile, China responded with 200,000 troops, who captured Pyongyang and pursued the Japanese forces southward until they only held the southern tip of the peninsula. Peace negotiations proved fruitless and were broken off because China demanded that Hideyoshi acknowledge Chinese overlordship while Hideyoshi demanded a part of Korea to be ceded to him, the marriage of a Ming princess to the Japanese emperor, and Korean princes as hostages. 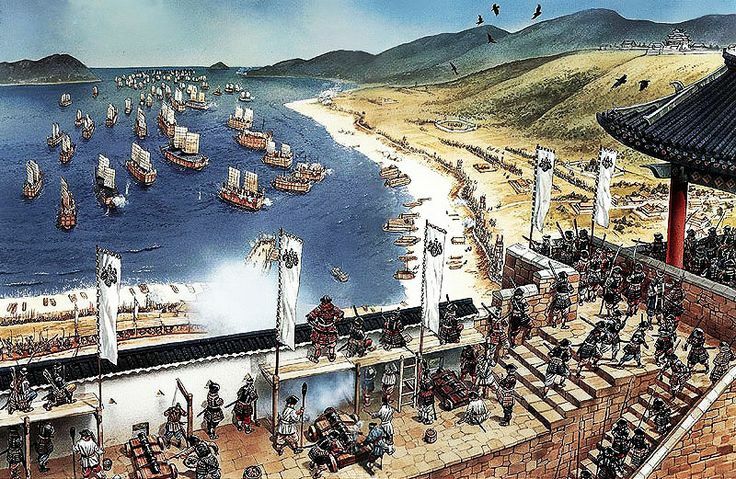 Undaunted, Hideyoshi launched a second invasion in 1597 but proceeded no farther than Korea’s two southernmost provinces because both the Koreans and the Chinese relief army were prepared. When Hideyoshi died in 1598 his army quickly returned home. In 1606, Tokugawa Ieyasu, the new shogun of Japan and Hideyoshi’s successor, made peace with Korea. The two Japanese invasions inflicted terrible sufferings on the Koreans. Whole areas were devastated and depopulated and many historical sites and libraries were burned. The Yi dynasty of Korea never fully recovered its authority and the country its prosperity. The retreating Japanese moreover took many looted treasures and took as prisoners men with skills, most notably Korean potters, who built up Japan’s ceramics industry. Hideyoshi’s dream of ruling Japan died with him because his son was too young to rule, allowing another feudal lord, Tokugawa Ieyasu, who had not participated in the Korean campaigns, to seize power. Finally the cost of the war weakened the already declining Ming dynasty in China. 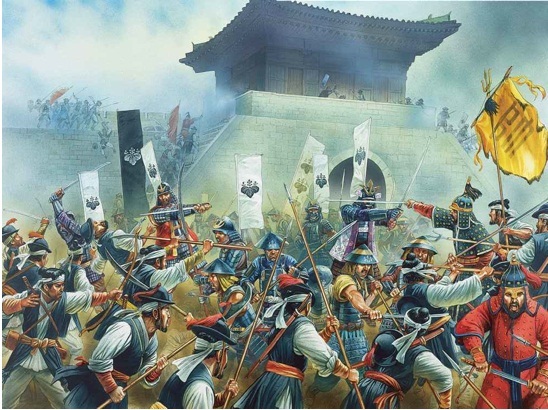 Additionally, the sending of a large army to Korea denuded southern Manchuria of Ming garrisons and paved the way for the rise of the Manchus.